I’m excited to announce a second session of the eCourse with ALA Editions and SJSU iSchool entitled Winning Support and Influencing Communities for Library Funding. After the success of the previous course session, I’m providing it again with updated data and information from the recent release of the second “From Awareness to Funding” study. We’ll also dive deeper into local data and recent political innovations that can be applied in communities of all sizes in order to cultivate and build support for local library funding. It’s no secret that over 90% of library funding comes from the will of the local voters and the local politicians. In fact, on average, only 3-5% of library funding comes state legislative issues, and only another 3-5% of library funding comes from federal legislative issues. That means that libraries and library staff have to learn how to navigate and influence the local political environment to build support for funding for their community library. Whether that support comes from voters or political pressure on local boards and councils, this course will teach the skills you need to get the funding that your library deserves. Whether you are going to the voters in the next year or next 5 years, you can get started today by learning the skills, tools, and political theories used by some of the largest and most successful campaigns in the country. In this course we’ll look at the ways that libraries can start re-building voter support in the years before an election. We’ll learn from some of the most successful presidential and local campaigns and discuss the ways that libraries can adapt their tools and tactics within their own communities. The earlier that you get started building the political support you need, the easier it will be to make an ask for increased library funding from both the voters and the local legislators. OCLC’s recently released second study measuring voter and political support for libraries found that over the last ten years general favorability of libraries has increased but overall voter support has dropped by over ten points. We should be alarmed by these results because more than 90% of library funding comes from the will of the local voters and the will of the local politicians. Without this political support, libraries in the United States are at risk from significant losses of funding and the potential for widespread closures as we’re seeing in many areas of Europe and Canada. That’s why this course is especially designed to focus on learning how we can encourage the voting public to take meaningful action to support library funding and apply pressure to our political leaders to ensure that they continue to fund libraries. 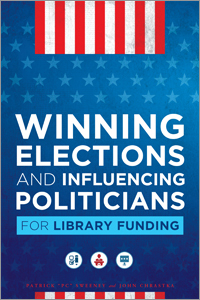 If your library is not dependent on voter engagement for funding, we will also explore the skills that you need to build political power within your community to influence your local legislators. We’ll look to major causes like Fight For Fifteen and Standing Rock as well as national PACs and political organizations like the Human Rights Campaign and Sierra Club and we’ll discuss the ways that libraries can apply those tactics in their day-to-day work to influence their local political ecosystems. Everything we teach in this course has been tested in the political field through campaigns and political actions. 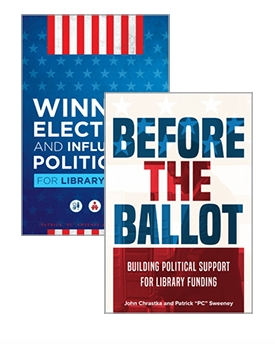 EveryLibrary has worked on over 75 campaigns and over 50 political actions at the local, state, and federal level. Through these campaigns we’ve built and tested a wide range of tools and tactics that have a strong history of success through restoring funding and increasing support for funding and political initiatives. In fact, the tools and tactics that we teach in this course have helped EveryLibrary return $1,600 in stable library funding for every dollar we’ve raised. In this course we will show you how to build and use these tools in your own communities.